Like most Agatha Christie stories, Murder on the Orient Express is all about the “whodunnit?” Once that question has been answered, there’s little reason to revisit the story. Christie never cared much about character development and her main detective, Hercule Poirot, was a two-dimensional sketch of early 20th century intellect and masculinity. (She actually grew to hate the character over the years, calling him, among other things, a “creep” and “insufferable”, despite continuing to write about him.) Therefore, Kenneth Branagh’s new, workmanlike interpretation of the tale will be met with different reactions from those who are familiar with the ending and those who aren’t. It makes a big difference. This represents the fourth time a major adaptation of Murder on the Orient Express has been mounted. The first, a 1974 motion picture featuring Albert Finney as Poirot, was well-received and highly regarded. In 2001, a poorly-reviewed contemporary version aired on CBS-TV with Alfred Molina in the lead. The long-running ITV Poirot series with star David Suchet tackled the novel in a 2010 episode. Curiously, the most famous Poirot prior to Suchet, Peter Ustinov, never appeared in any version of Murder on the Orient Express, despite reprising the detective’s role six times. Branagh therefore steps into well-worn shoes and, although his performance here is no match for Ustinov or Suchet (the latter of whom is universally regarded as the inimitable Poirot), it stands alongside the others. The cast is star-studded, which means that, although there are a lot of famous faces, no one except Branagh gets more than a few scenes and/or lines. The movie, like the book, is plot-centric and, because so little effort is placed on character development, it’s less than an actor’s clinic despite the “who’s who” aspect of the cast. The list of suspects includes Judi Dench, Derek Jacobi, Michelle Pfeiffer, Daisy Ridley, Olivia Colman, Willem Dafoe, Josh Gad, Penelope Cruz, and a few “lesser” known performers rounding out the rogues’ gallery. Johnny Depp plays Edward Ratchett, the unlucky victim, so his screen time is over before the first half hour comes to a close. Haris Zambarloukos’ evocative cinematography meshes well with Branagh’s decision to use 65 mm cameras (the first time he has done so since Hamlet). This allows for a more epic “feel” to the visuals even if seen in a regular theater with digital projection. He often uses long takes, especially early in the movie for the characters’ establishing shots (either in the station or aboard the train, where he pans along the length looking through the windows from outside). Period detail is excellent and there are times when it’s possible to imagine being aboard a luxury train wending its way through the cold, snowy mountains on the route between Istanbul and Paris. Patrick Doyle, who has done his best work as a composer when paired with Branagh as a director, modulates his occasionally overbearing tendencies and produces an effective score. The movie opens at the Wailing Wall in Jerusalem where Poirot exhibits his skills as a detective by solving a particularly nettlesome crime. He then boards the Orient Express when his presence is requested in London and intends to use his time aboard the train as a mini-vacation. It turns into one of his most difficult cases when one of the passengers is murdered and everyone in the car is a suspect. With the train stalled because of an avalanche, Poirot conducts his investigation. Branagh’s interpretation draws on aspects of many of his predecessor’s performances and, although the character’s pomposity is used for semi-comedic purposes in the early scenes, the tone becomes increasingly serious as the details of the case are unveiled. Aspects of Christie’s original were loosely inspired by the Lindbergh kidnapping. This isn’t surprising since the infamous crime occurred in 1932 and Christie wrote Murder on the Orient Express about a year after that. The movie’s ending, although mostly faithful to the book, skews toward the way the Poirot TV series addressed the moral conundrum. 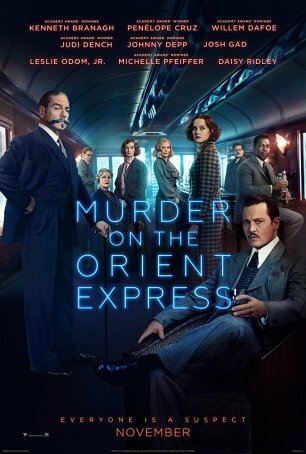 For those who don’t know the ending, Murder on the Orient Express represents a gripping mystery told in a classic style with enough “detecting” to allow the viewer to guess along with Poirot about who may be guilty. There’s a lot of exposition; at times perhaps too much. It can be difficult to keep the cast of characters straight and even more of an exercise to piece together how they fit into a larger picture. Nevertheless, the big reveal is as impactful as ever. Those who are aware of the killer’s identity will be less engaged. Still, there are pleasures to be had: Branagh’s performance, the set design, the camera work, and the tight pacing. This movie is an odd choice for Branagh; Christie’s straightforward, no-nonsense prose is in many ways the antithesis of the Bard. It has, however, been decades since Branagh has tackled Shakespeare for the screen. In the interim, he has moved to other properties, most recently making a live-action version of Cinderella after providing entries into the Thor and Jack Ryan franchises. Murder on the Orient Express reunites him with three actors from the “Branagh troupe”: Judi Dench, Derek Jacobi, and Gerard Horan. Perhaps the most welcome thing about Murder on the Orient Express is the big-budget foray into a genre that motion pictures have all-but-forgotten: the classic murder mystery. The film isn’t too long to wear out its welcome and there’s something impressive about being surrounded by such impeccable detail and so many familiar faces. Although the film will work considerably better for newcomers to the story, there’s enough here to appeal to veterans. And, although Branagh is no Suchet, he’s good enough for us to accept him, if for only two hours, as one of Agatha Christie’s two celebrated detectives.